This customer wanted to update their dated bathroom located in the basement. The original layout was poor, and there were numerous plumbing issues. We gutted the entire space, re-designed the layout, relocated and upgraded all the plumbing and electrical (all permits pulled). The insulation in the exterior walls was upgraded, and new moisture-resistant drywall was installed throughout the space. A new, larger, walk-in acrylic shower was installed, along with a new vanity and storage tower. We custom built a new adjustable shelving unit, and installed new sheet vinyl flooring. Two new coats of paint finished off this stunning basement bathroom! This bathroom renovation was for a client with minor mobility issues. The tub selected had a lower threshold in order to make entry into and out of the tub easier. A beautiful tile for the shower surround was chosen, along with a gorgeous sparkling accent tile. A custom vanity was installed with a stunning granite top, undermount sink, and a wide-spread faucet. Vinyl tile flooring and new toilet were also installed. The client chose matching accessories (towel bar, toilet paper holder) to match the sink faucet. 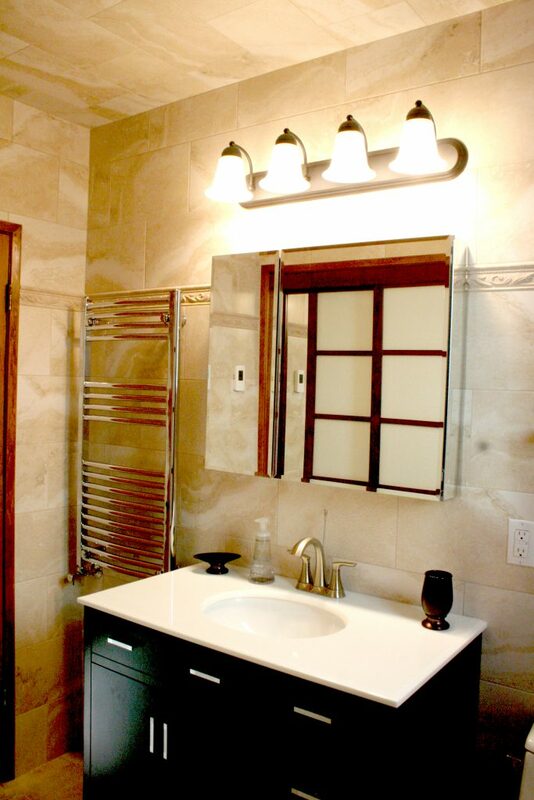 A custom mirror and new light fixture above the vanity completed this fabulous renovation. 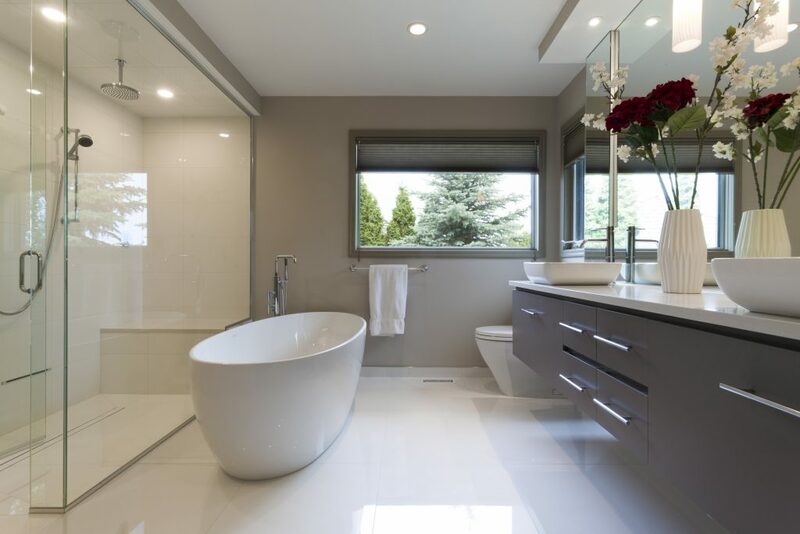 Sleek, modern and matching is the theme for this main bathroom renovation. This clients’ bathroom included a bone coloured acrylic tub, biscuit sink and white toilet with varying shades of beige/brown tones from the floor going up. A bright white acrylic surround and tub unit was installed. 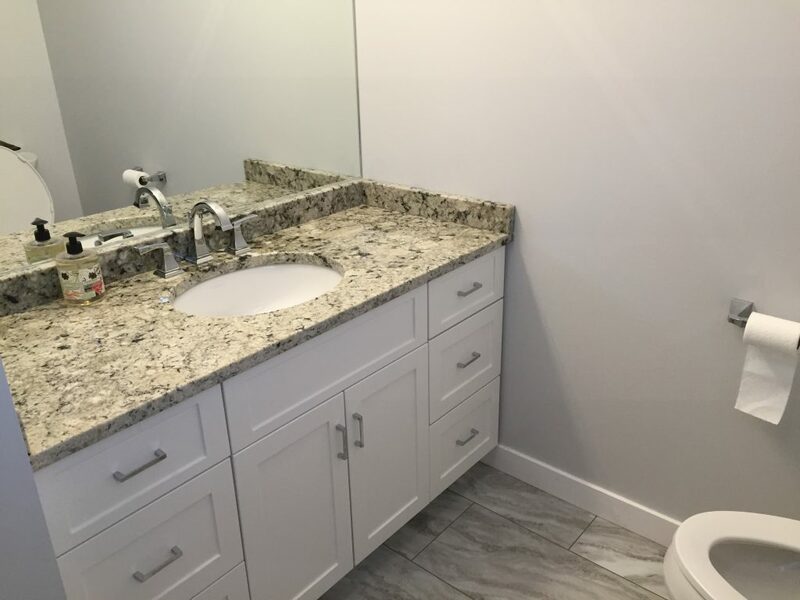 The bright white continues through the room with a white 48” vanity, beautiful Carrera marble quartz top with sleek, square undermount sink, white wall cabinet with crown-moulding and white-shaded lightbar. Dark vinyl sheet flooring was replaced with luxury vinyl tile in an urban slate natural grey that complements the white through-out the room. This client needed to update their tired, dated, and worn out ensuite. Built in the 1980’s, the existing flooring was carpet! YIKES! We fully gutted the space, and installed a new acrylic walk in shower with glass doors. An LED pot light above provides nice light while showering. An ultra modern corner tub, with deck mounted faucet was installed – and a grey slate tile surround. A custom vanity with laminate top, sink and faucet added a great look, along with a beautiful sheet vinyl floor. 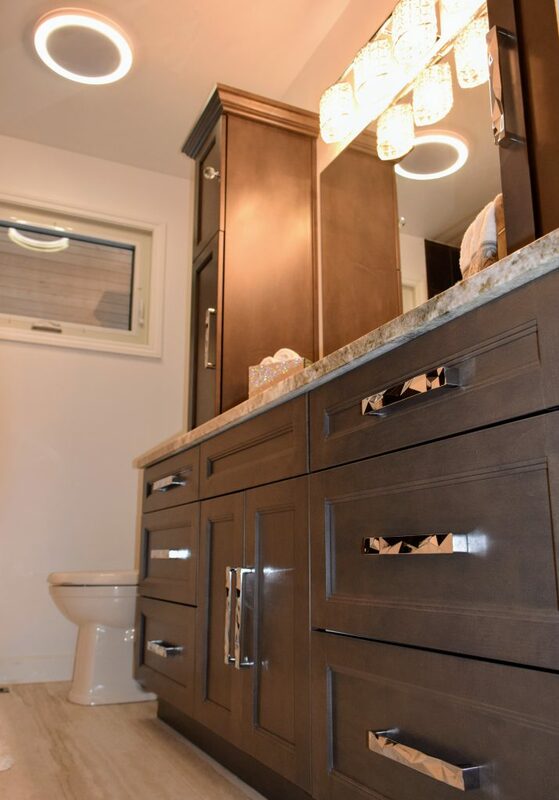 A new toilet, custom mirror and light fixture completed this stunning new ensuite! 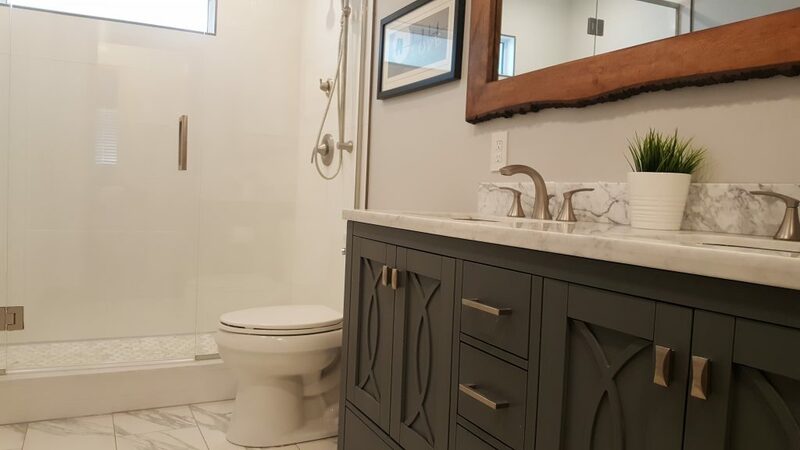 This bathroom renovation was awarded to the client as part of our contest at the Winnipeg Renovation Show 2018. The client chose to have us do additional work over and above the scope of the pre-selected contest prizes – and to cover the additional costs . We fully gutted the space, and built a beautiful custom tiled shower with shampoo niche and glass door. A custom milled vanity was installed with a stunning quartz countertop. A new sink, faucet, and new toilet were also installed, along with new vinyl tile flooring. The finishing touches with mirror and paint completed this gorgeous ensuite! This project started with a leaky shower. The bathroom in this house was the original. The customer chose to do a full bathroom remodel instead of just fixing the shower. The old shower was removed and a larger open shower with sliding glass doors installed. The old jacuzzi tub was removed and a stand alone tub was put in its place, making the room feel much larger. Porcelain tile that looks like marble but without the maintenance of marble was set throughout. 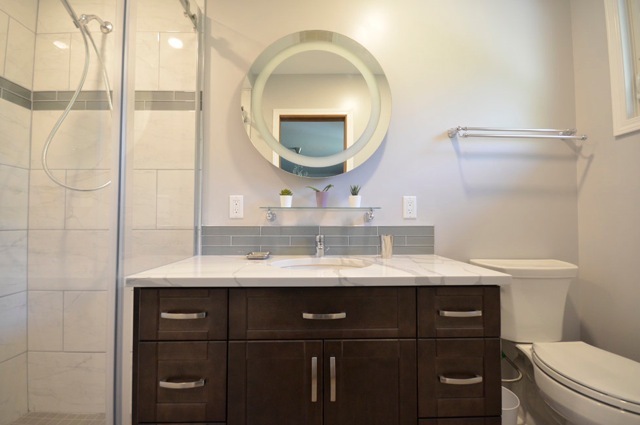 A new vanity and modern fixtures complete this beautiful room. This 1950’s bathroom was well in need of a major update. Our clients wanted to completely transform this disjointed space into a bright, open, usable space with maximum storage capacity. The window was resized to improve natural lighting, radiators deleted and plumbing and electrical were fully updated. The oversized 48″x84″ shower features beautiful large format tile and hex marble floor with a 24″ bench. Custom glass doors were installed along with 12″x24″ tile and in-floor heat for year-long comfort. Unique touches include two large pantry cabinets for organization and a grey double vanity and striking wood framed mirror. 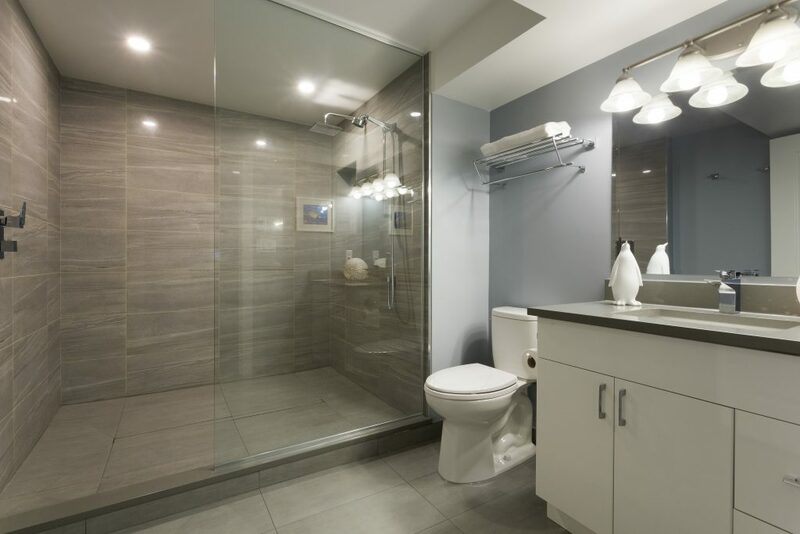 Maximizing style and storage within a tight budget was the goal for this bathroom renovation. Was it successful? You be the judge. Floor to ceiling tile transformed this previously dark cramped space into a spa retreat with features including: a huge doorless shower with bench seating, dual shower heads, heated towel bar, large wood, glass and mirrored linen close, brilliantly illuminated with a combination of pot lighting and 4 fixture-overhead vanity lighting. Add an environmentally friendly low flow toilet and you’ve got a spa retreat with an conscience. The client wished to turn a standard 5′ x 8′ bathroom and turn it into a home spa. It featured a soaker tub with large tile surround to give it a more spacious feel. A large recessed storage nook for personal toiletries. A custom vanity featured 2 matching towers with crown molding, and custom mirror to make the space feel larger. The shower featured a rain shower head with adjustable telescopic wand for comfort. Stunning tile work provided a soothing atmosphere. A combination LED light, with custom mood music and exhaust fan finish the spa like atmosphere. This basement had a large corner of unused space being wasted. 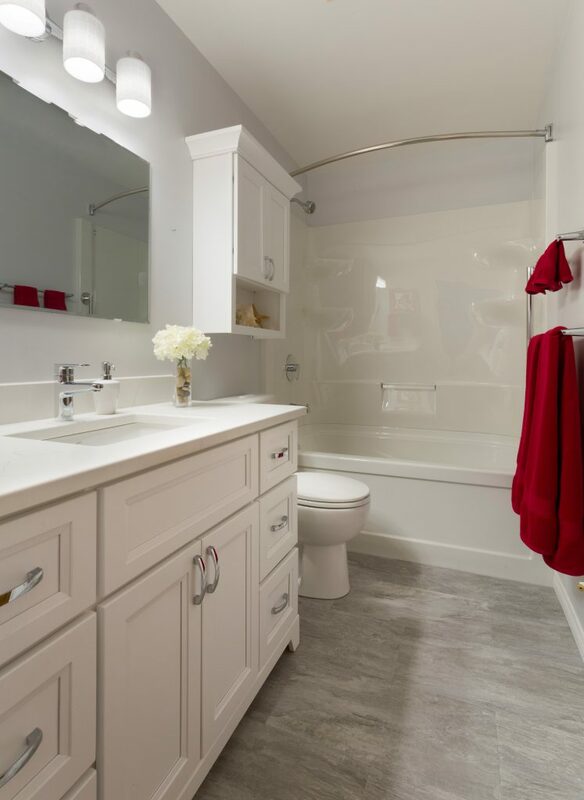 An extra bathroom was a must for the large family of 7 living in the home. From framing the walls, to leveling the floor to providing an over-sized walk-in shower, this space was transformed. Large format tiles span the floor and shower base complete with large concealed linear drain. Corresponding high gloss tiles flank the shower walls up to the ceiling. A custom fixed glass allows for easy entry into the shower unit. A bulkhead above the vanity houses the venting while not restricting the size of the room. This main bathroom needed a refresh as it was lacking storage and style. Changing and opening up the tub shower was the main focus on the bathroom. An alcove air-tub with tiled skirt and half-wall replaced the old pink bathtub and wall panels. 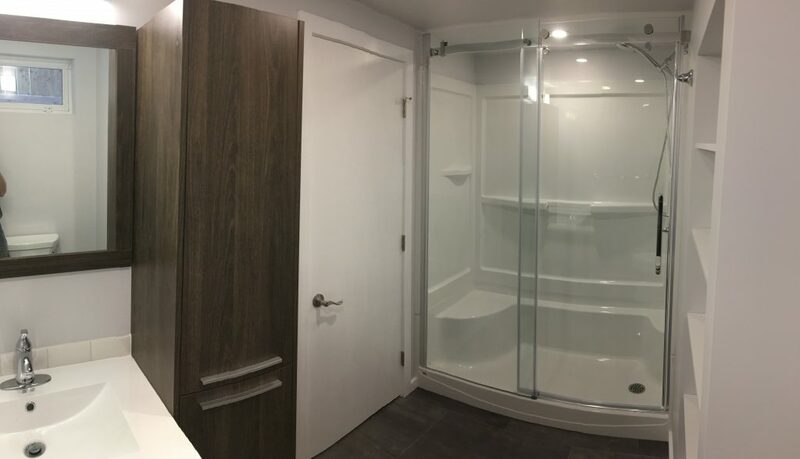 An adjacent bedroom closet was converted to allow for a separate walk-in shower showcasing tiled walls to the ceiling, ceiling-mounted rainhead and custom shower door. 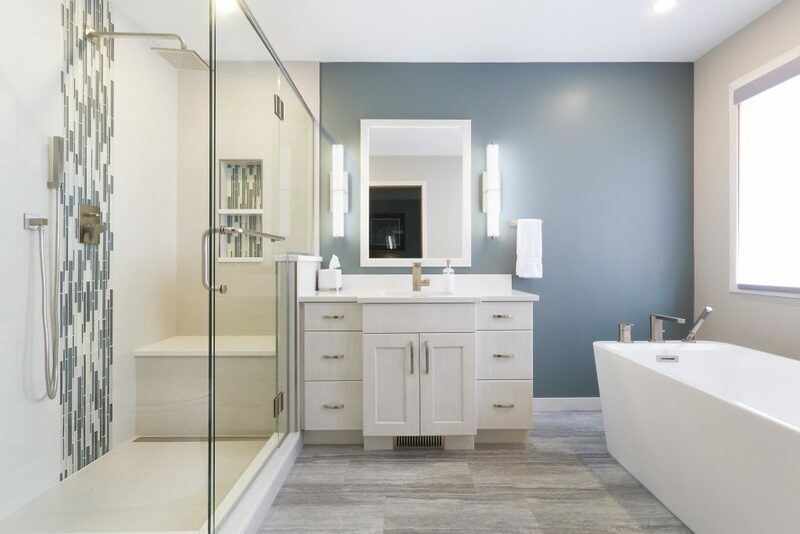 Creating an open concept bathroom in a tight space was difficult at the beginning but the results were above and beyond the clients’ expectations. The client was more then ready to renovate his 1940s, bungalow main bath. Based on a referral from a trusted colleague he contacted ICAN Construction & Renovation. The goal was to maximize the use of limited space, stay within the feel of of the era of the home and include custom finishes and elements. The existing tub was replace with a porcelain tiled, walk in steam shower. Graphic decor tile with hexagon mosaic accents were chosen to create high impact in limited space. A floating self illuminated vanity was installed to maximize the open feel and add a clean modern atmosphere. Having a full 4 pc bathroom on the 2nd floor in River Heights was quite a bonus! But the 70’s design and mechanical / structural issues were too much to overlook, so a full gut and re-do was called for. The ample space allowed for a shower/tub/toilet/sink 4 pc bathroom. Older, historically correct styles and products were chosen. The bathroom had to have it’s floor rebuilt due to grossly incompetent previous reno’s and mechanical changes. A heated electric radiant floor was installed. Custom tile and glass were used to create a corner shower c/w corner quartz seat and 2 niches. This Oakridge bathroom was from the late 90’s with a poorly planned use of space. The custom showpiece bathroom vanity and turquoise accent wall behind became the stunning centerpiece of the room. 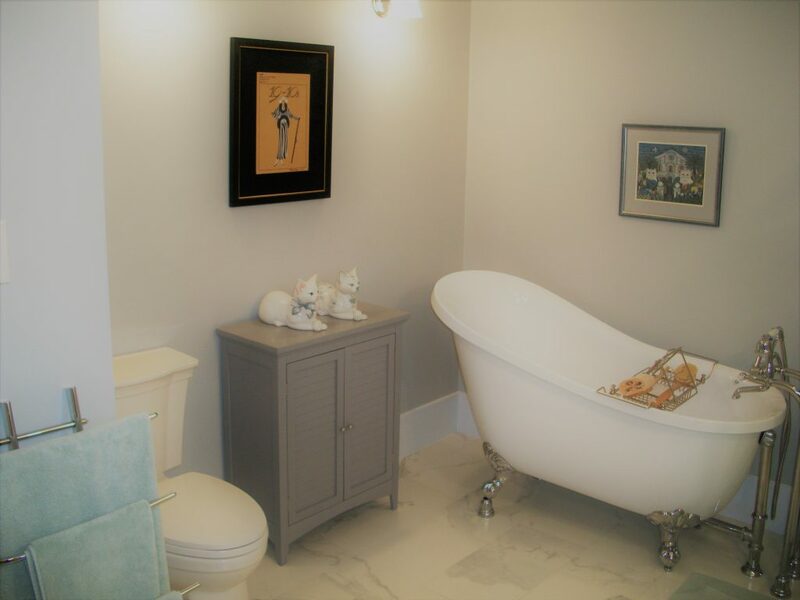 We took the drab bathroom to a completely different level by installing a free-standing elegant tub. The toilet was relocated to a different spot in the bathroom giving us space to create a larger, glass, low entry custom tiled shower which was a vast improvement from the ‘neo-angle-style’ corner shower they previously had. The glass mosaic accentuates the wall niche and gives character to the stone bench area. 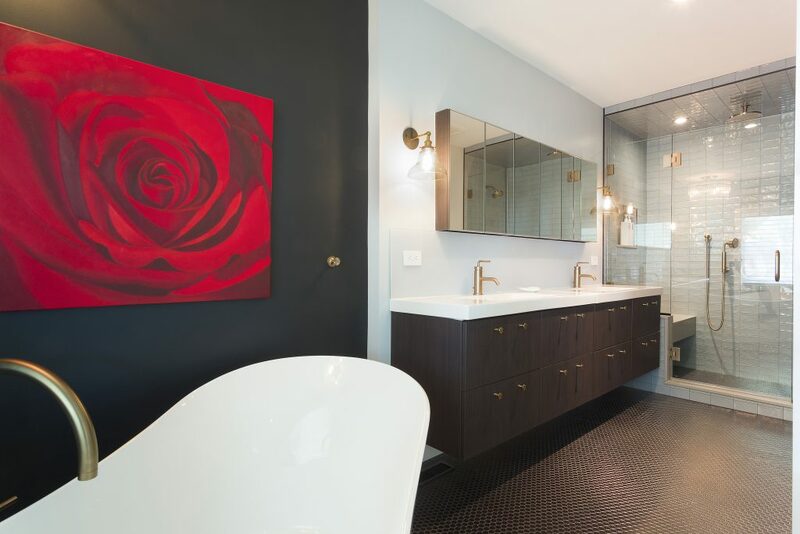 This master ensuite bathroom shouts 1940’s glam with clean lines, quality tile and brass finishings. Features that transport you from 2019 to 1940 include: dramatic black feature wall displaying striking red artwork; sleek Mirolin, Sussex freestanding soaker tub; Kohler brushed bronze bath fixtures; floating maple veneer dual sink cabinets; heated ensuite shower floor with Julian Mosaic Moon tile; dark pennyround tile with white grout on floor; straight stack slate grey Julian Tile with watery uneven texture (tile in shower); three shower head options; Ceasarstone used for the shower bench and niche. 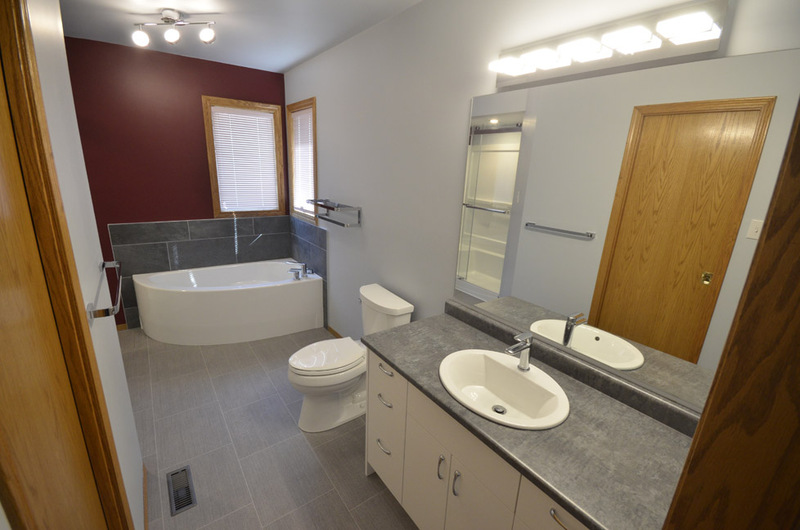 This ensuite bathroom went from closed off and dark to spacious and bright! We gave these happy clients a complete transformation with large format white glossy tiles on the floor that flowed continuous through and up the shower. 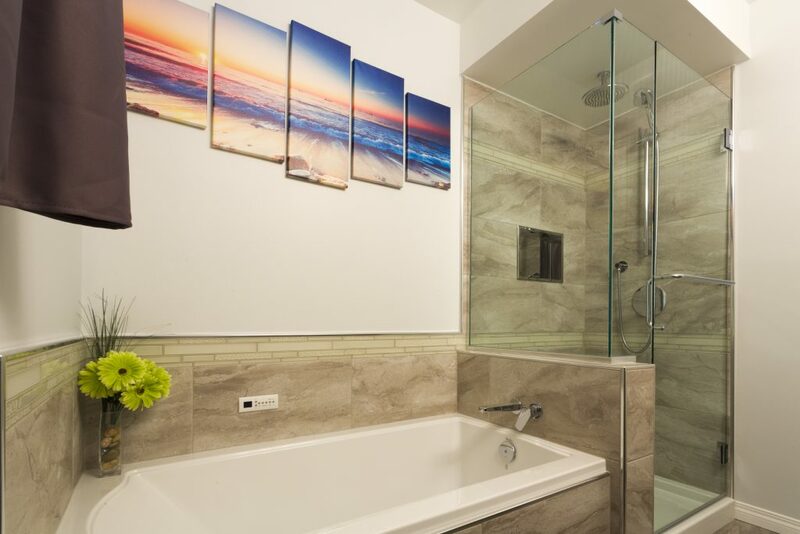 The custom size shower was done in a tunnel-design to maximize space in the room, allowing a large walk-in no-threshold shower with tiled bench and a large freestanding tub centered as a focal point in the room. 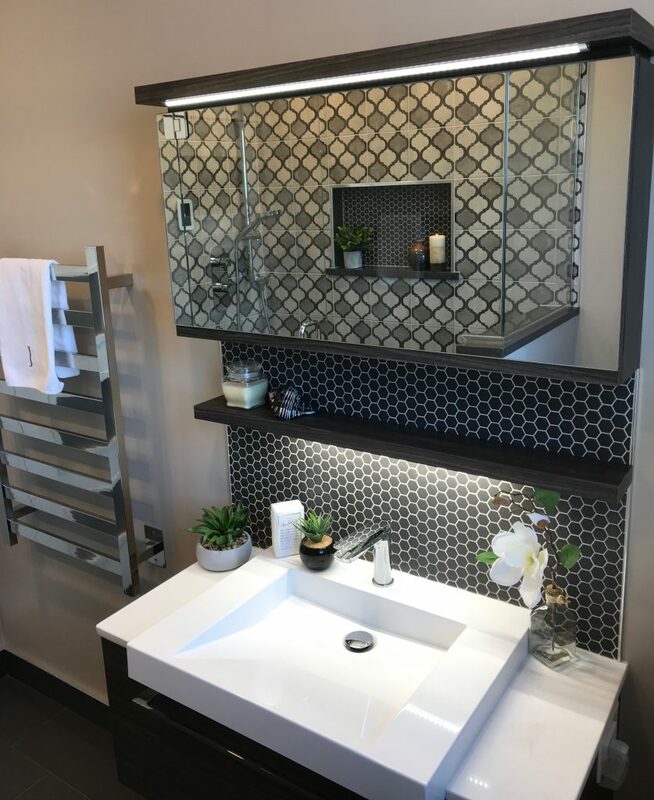 A large custom mirror with built in medicine cabinets sits atop the soft grey wall-hung double sink vanity. 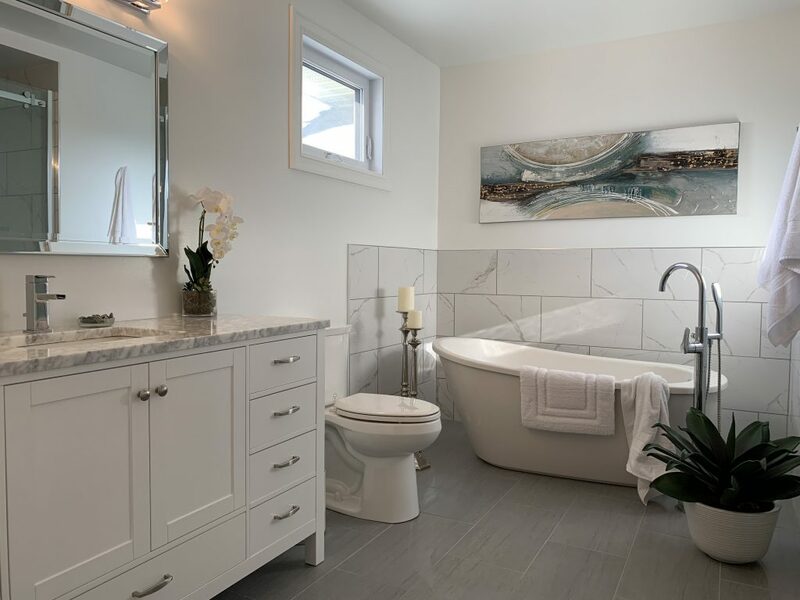 This enchanting ensuite was designed to allow for the full appreciation of the natural beauty outside while providing all the creature comforts and luxury of a spa retreat inside. The new floor plan and finishes were strategically selected to mirror the beauty and texture of the parklike river property with floor to ceiling windows facilitating a truly seamless environment. Luxury features include rich horizontal grain walnut cabinets, a large free-standing tub, 24″x24″ straight stack marble look tile with in-floor heating, 3-sided gas fireplace, concrete counter tops, floating vanity, doorless walk-in shower with bench seating and vibrant brush bronze plumbing fixtures. Designer/Customer: A sublime minimalistic Japanese style bath retreat. Can you do this for us? Richter Construction: Of course we can! Not the typical bathroom Reno, Yeah! We were excited to start the process. Designer Lyndsay Stokes approached us with this very unique project. 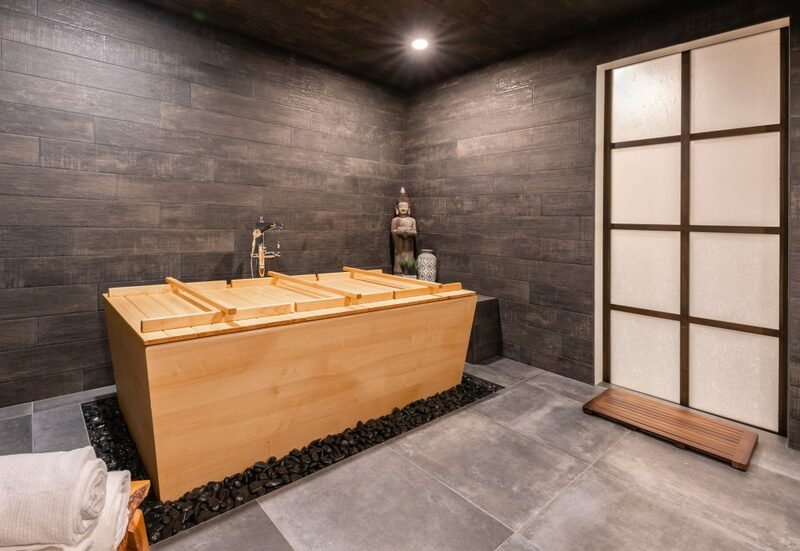 Homeowners wanted a Japanese style bath/shower room that was completely waterproof. The main focus, a Japanese soaking tub custom made by Zen Bathworks in Alaska of all places! After some unique design challenges, extensive waterproofing, and tile work, the bathroom was completed. The excited homeowners couldn’t wait to slide into that amazing tub!